Says it can’t find you? What’s that you say? Literally infinite damage? Yes, please! I couldn’t find @Neumannium either. But I had that with @geigerm who could find me okay … so just a “thing of the beta” I guess. I am rob at thomasson dot com. halfvoid at gmail dot com if you wanna add me. I didn’t get an email verification link when I first set up my account, so I re-entered it and got the link. After that, I think, people have been able to add me as a friend. I just realized they totally borked the view your own deck. you can view your discard, but when you try to view your deck, it’s the opponents I think. Beta, so all good, but helpful to realize. Yeah lost 3 games for that, just realized as well. They said they know it and will addressed in next patch. Just inadvertently scrapped my Infinity Shard; forfeited. It was comedy gold. That would only matter if you were going for a shard win. 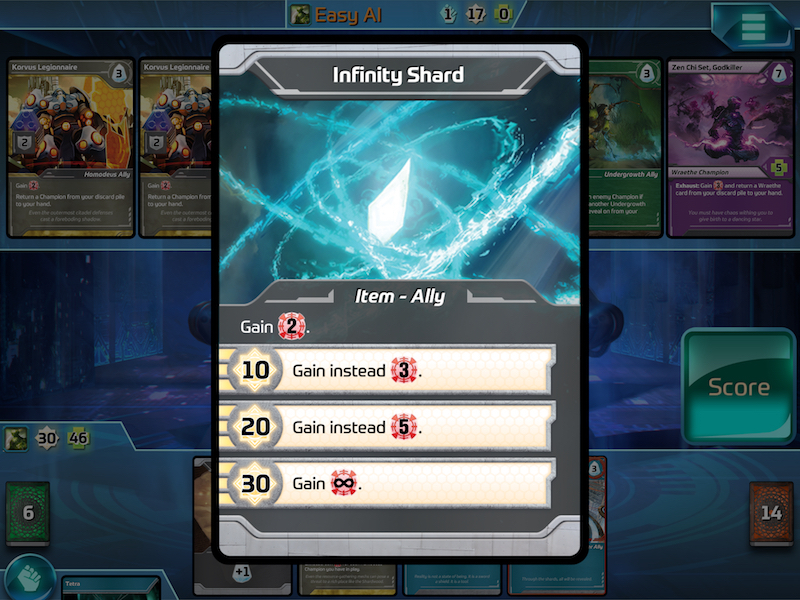 I actually find it difficult to build an in infinity shard deck. You really need the middle row to be kind and give you shard building cards. Generally you need blocks/heals with it also, as your opponent should probably try to counter with fast aggro. My email should work now. I never went and clicked the link in the email to verify it, apparently. I also scrapped a card in error. But, in my case, I think the text was “scrap”, not “may scrap” and I was thinking Ascension where banish is usually an optional act with a choice of “None”. Steam is out in early access. PC only, no Mac version. Looks like I have to buy an iPad soon ;-). Think I saw someone mention that multiplayer isn’t live in the Steam one yet.